We have been working harder in the studio this month than Santa’s elves completing the finishing touches to a couple of interior schemes so our clients can enjoy their homes in time for Christmas. We were also in the festive spirt early this season as we have enjoyed working with a handful of local businesses in South London to create simple, yet stunning, Christmas window campaigns on a shoe string. 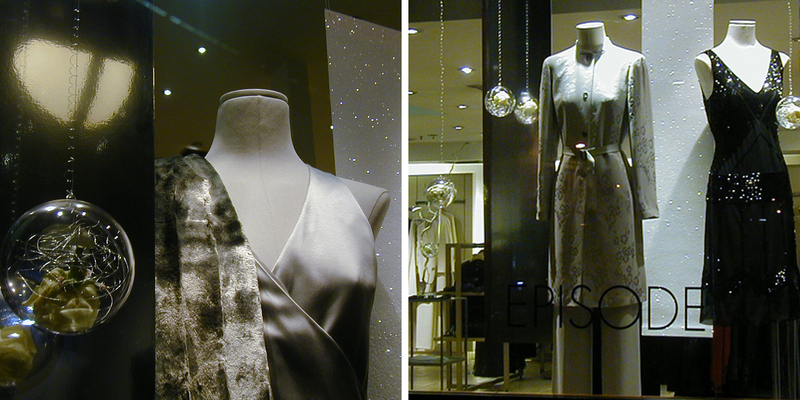 As a little gift to our local small businesses here are our top 5 window display tips. The key inspiration this holiday season is to ‘hero’ your product in the window and less about theatrics. This is perfect for smaller retailers as you can create a real impact with a little imagination and a sprinkling of fairy lights (which are definitely not just for Christmas!) At Paint the Town Green an Eco Paint company based in Wandsworth, we wanted to hero their paint. We created a simple yet effective window by stacking their beautiful graphic paint pots into the shape of an abstract Christmas tree. We decorated a few pots with gorgeous oversized red bows and draped them with fairy lights to add a little sparkle. We then made sure to continue this in-store to make a bigger festive statement. A very cost effective yet bold statement for Christmas that was easy and quickly achieved. Remember to always keep your brand message clear, yet seasonally inspired. Try to create an experience for your customers. 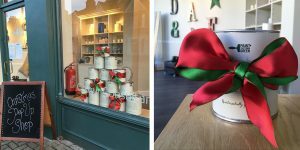 Our Christmas message for Paint the Town Green was “Give the Gift of Colour”, highlighting their gorgeous colours as well as advertising the Christmas gifting pop up shop created instore. So many designers and artists this year have collaborated with brands and Paint the Town Green have cleverly collaborated with local artists and small creative businesses from the Decorcafe to create a stunning mix of thoughtful gifts and original homeware within their pop up gifting shop. This is a perfect idea for small retailers such as furniture and kitchen showrooms that want to increase footfall over the festive season while supporting other local creative business that complement your brand. I have designed for many luxury brands and you don’t have to spend a small fortune to make a window look festive and luxurious, you just need to give your scheme a little thought. Simple oversized Christmas decorations grouped together and repeated can look stunning and impactful. Fresh real garlands giving the customer a full sensory experience or olive trees look super stylish and are a modern twist this season. DZD and Moorplan are specialist visual merchandising retailers who have plenty of window display ideas, you don’t have to buy in bulk and you can tailor to look bespoke. Also, high street favorites such as Paperchase and Muji are brilliant resources. You just need to keep your brand aesthetic in mind and think about the customer experience. You need balance in the window scheme so think about creating height in the form of a pyramid shape with product and not just filling the whole window as your customer won’t know where to look. Remember to look at the shape of your window and to focus the display. Items always look better arranged in multiples of 3 and 5 rather than 2’s and 4’s – trust me it’s a visual trick. Try and tell a story by grouping items with a similar theme together or arranging by colour to create a bold statement. Give special items space to ‘breathe’ – abundance is good for bestsellers but a 100 of an expensive item tends to devalue the item! There are so many simple off the shelf modular systems out there now that you could hack and use to create an effective window display. You should not just think about Christmas when planning the window so keep things reusable – a simple set of wooden crates or cubes can be transformed with a lick of paint each new season! Your shop front is the window into your brand and should be as big a focus as any social media message so make them work together and have the same look and feel, whether it’s too celebrate the Tennis in Wimbledon fortnight or to highlight the new spring summer range these are the little details that enhance your brand and make you stand out on the high street. But most of all try and enjoy the process and have fun with it. This entry was posted in News, Uncategorised and tagged Christmas-window-design, nikki-rees, retail, small-business, Visual-merchandising, visual-merchandising-for-small-businesses, Wimbledon-interior-design, Wimbledon-interior-designer by n1kkir33s. Bookmark the permalink.